Colette Bennett for hlntv.com. Follow the link below for a gallery of photos.Art is made for others to see, so one might question why an artist might choose to create it in a place where no one would: Other than fish, that is.Or, in Jason deCaires Taylor’s case, he might question why he would do it any other way. After all, thousands of people have flocked to see his work ever since he started creating it in 2006. 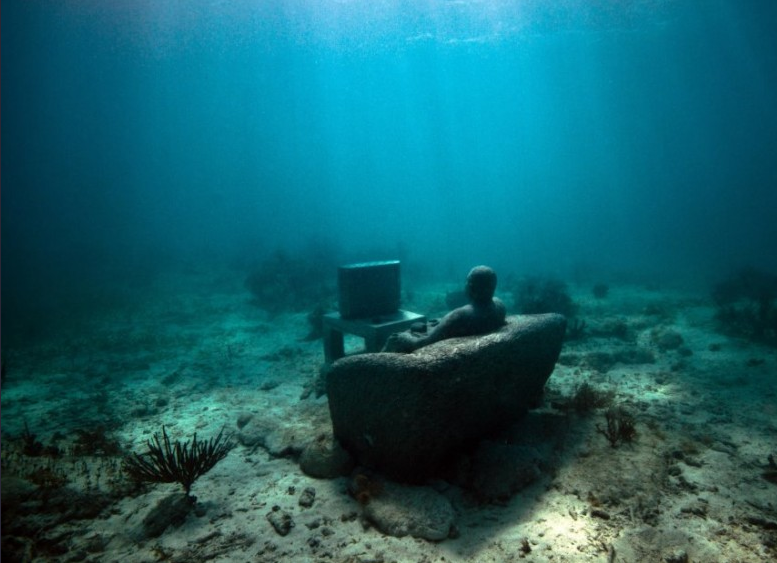 That was when Taylor created his first underwater sculpture park off the coast of Grenada in the West Indies. It’s since been named one of the 25 wonders of the world by National Geographic Magazine. Taylor’s sculptures depict humans in dozens of different expressions, from single statues to multitudes. He creates them on land, and then, each statue is lowered into the sea. To date, he has created nearly 600 sculptures that act as artificial reefs for sea life, and has no intention of stopping anytime soon. At first when he started the project, the locals thought Taylor was a bit mad. “They thought I was some crazy Englishman,” he told HLN. Clearly, they changed their minds as the work steadily began to attract more and more visitors. One of the most interesting things about the sculptures is how they change underwater as they are altered by the force of water and undersea creatures. Taylor tells HLN that sometimes he loves the results, and sometimes they change the figures in ways he doesn’t like at all. “But that’s a part of it, letting whatever will happen, happen,” he says. Taylor recently relocated from Cancun to the Canary Islands, where he has a whole lot of water calling his name. “I’m not going to be filling up the Atlantic Ocean anytime soon,” he told HLN, a smile in his voice. Taylor tells HLN that while he loves creating the statues, there’s a certain process to moving them to their watery home that requires a bit of courage.